MAPS: Henham Park (plus detail) and Norwich with Halesworth/Southwold. When clicked, thumbnails popup enlarged versions of the images. We thought this picture to be one of the most delightful we have featured. It comes from Ian Davey's SuffolkCAM.co.uk as part of a gallery covering the 29th Grand Henham Steam Rally. Though retaining its name the show has now moved from its home on the Henham Estate in the English county of Suffolk, to the showground for the county of Norfolk, which is in the city of Norwich. We cannot help but think that a grander name is now deserved. Check out Ian's web site for a Wolf Brewery liveried famous 1918 Sentinel steam truck; a 1906 Rover shows its paces ahead of a Jaguar; there is a rack saw, cider, a miniature train and tractors in every imaginable tractor color; there are even vintage bicycles… HEY! what does the 'vintage' label mean? Surely they can't be that old? We clearly remember those red bicycles doing their rounds in the United Kingdom before Lance Armstrong popularized them for USPS postie boys! Thumbnails popup enlarged images. The first picture is available full size. 23 September 2002 was the 100th anniversary of the death of Major John Wesley Powell, who was a Civil War hero, an explorer of the American Southwest, and a government official whose work is even more relevant today than in his own lifetime. 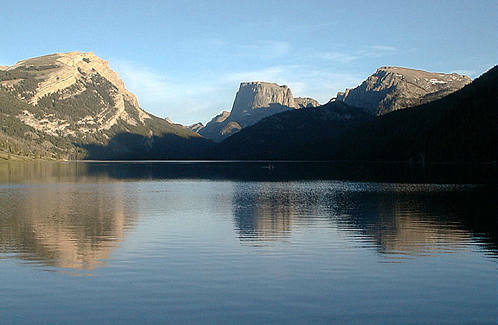 The featured picture above, by Earl & Gail Cook, is of Green River Lake, near the source of the Green River. The Green begins high in the Wind River Mountains on the west slopes, close to where seven of the largest glaciers in the Rocky Mountains are located. The picture comes from the Green River Rendezvous 2000 web site by Earl & Gail, which is highly recommended if you have any interest in the Old West, or even just enjoy a good yarn with pictures. Little Dale Lake is the official source, a lake that is half frozen most of the year. Powell was the first man to navigate the 1,500 mile length of the Colorado River basin, and his journey began on the Green, ending where the Colorado leaves the Grand Canyon. [Smithsonian Institute: BAE Negative #64-2-13] Powell is pictured left, in a photograph by Wells Sawyer taken around 1886, sitting in his Adams Building office. The picture is courtesy of the Smithsonian Institute from their story of the founding of the National Museum. After a distinguished military career, he lost his right arm at the Battle of Shiloh, Powell returned to his academic life as a geologist. Powell became an explorer, but his contribution to modern life was his work as the man who understood that the future development of the arid Southwest United states was wholly dependent on water supply. He measured water resources (the terms 'run-off' and 'acre-foot' were developed from his work), trained other water specialists, and took his ideas into high office. He became a victim of the political in-fighting of his day, and his fall from power was rapid. He is buried in Arlington Cemetery, as befits a war veteran. Over the next two days we will retell his life story, and try to relate his work and ideas to a modern context. Powell is now attracting attention in a time when overstretched water resources, and the impact of water management of the environment, are becoming an increasingly urgent topic.